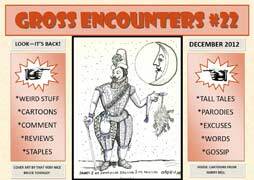 From out of the fannish wilderness it comes, Gross Encounters #22, some 14 years after the previous number. With articles, commentary, reviews and splashes of humour, it’s my much delayed “comeback” issue. The next one is already under way.